Anyone who has been to our house for brunch or spent a Sunday morning with us at an event knows that Kate makes the world’s best Bloody Marys. Trust us. 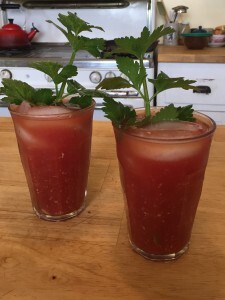 The following proportions are for one cocktail, but Kate usually makes Bloody Marys by the pitcher, using a 3:1 ratio of tomato juice to vodka and seasoning to taste. For a fabulous variation, try a Bloody Maria by substituting tequila, lime juice, and Tapatío hot sauce for the vodka, lime juice, and Tabasco. Add tomato juice to a shaker or pint glass without ice. Stir, adding the balance of the ingredients one at a time. Taste frequently until it’s spicy/salty/acidic enough. The drink should be well-balanced, but with an assertive presence of lemon and spice. Add vodka, stir thoroughly, and pour into a tall glass filled with ice. Garnish with a stalk of celery, a couple of pickled green beans, or a skewer of pimento-stuffed olives and peeled cooked shrimp.